The American people are increasingly dependent upon the Internet for daily conveniences, critical services, and economic prosperity. Substantial growth in Internet access and networked devices has facilitated widespread opportunities and innovation. This extraordinary level of connectivity, however, has also introduced progressively greater cyber risks for the United States. Long-standing threats are evolving as nation-states, terrorists, individual criminals, transnational criminal organizations, and other malicious actors move their activities into the digital world. Enabling the delivery of essential services—such as electricity, finance, transportation, water, and health care—through cyberspace also introduces new vulnerabilities and opens the door to potentially catastrophic consequences from cyber incidents. The growing number of Internet-connected devices and reliance on global supply chains further complicates the national and international risk picture. More than ever, cybersecurity is a matter of homeland security and one of the core missions of the U.S. Department of Homeland Security (DHS). At DHS, we believe that cyberspace can be secure and resilient. We work every day across the Department and with key partners and stakeholders to identify and manage national cybersecurity risks. We do this by adopting a holistic risk management approach. Like every organization, no matter how big or small, we must minimize our organizational vulnerability to malicious cyber activity by protecting our own networks. DHS also has broader responsibilities to protect the larger federal enterprise and improve the security and resilience of other critical systems. At the same time, we seek to reduce cyber threats by preventing and disrupting cyber crimes, and to lessen the consequences of cyber incidents by ensuring an effective federal response when appropriate. Finally, we work to create conditions for more effective cyber risk management through efforts to make the cyber ecosystem more fundamentally secure and resilient. 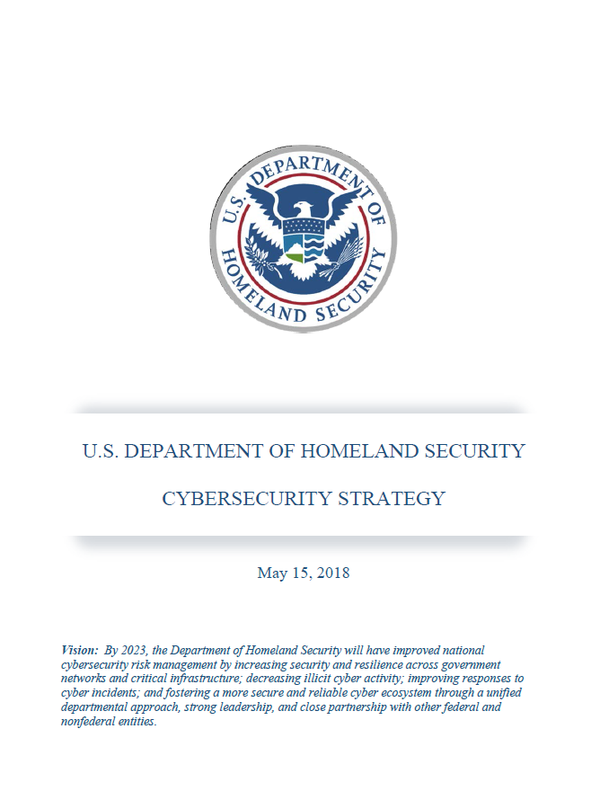 This strategy sets forth our goals, objectives, and priorities to successfully execute the full range of the Secretary of Homeland Security’s cybersecurity responsibilities. During the last several decades, advances in technology have fundamentally changed the world. Substantial growth in Internet access, use of Internet-enabled devices, and the availability of high speed information technology systems and large datasets have facilitated productivity, efficiencies, and capabilities across all major industries. The proliferation of technology also presents new cybersecurity challenges and leads to significant national risks. More than 20 billion devices are expected to be connected to the Internet by 2020. The risks introduced by the growing number and variety of such devices are substantial. The United States faces threats from a growing set of sophisticated malicious actors who seek to exploit cyberspace. Motivations include espionage, political and ideological interests, and financial gain. Nation-states continue to present a considerable cyber threat. But non-state actors are emerging with capabilities that match those of sophisticated nation-states. Criminal actors are increasingly empowered by modern information and communications technologies that enable them to grow in sophistication and transnational reach. Transnational criminal organizations also increasingly collaborate through cyberspace. Complicating the threat picture, nation-states are increasingly using proxies and other techniques that blur the distinction between state and non-state cyber activities. In a number of cases, malicious actors engaged in significant criminal cyber activity appear to have both criminal and nation-state affiliations. These diverse threats can impact federal and nonfederal information systems. Attempted incursions into government networks occur on a daily basis; the number of cyber incidents on federal systems reported to DHS increased more than ten-fold between 2006 and 2015. In 2015, a high-profile intrusion into a single federal agency resulted in the compromise of personnel records of over 4 million federal employees and ultimately affected nearly 22 million people. The growing interconnection of cyber and physical systems within critical infrastructure also creates the potential risk for malicious cyber activity to result in direct physical consequences; for example, the December 2015 overriding of controls in the Ukrainian electric grid resulted in widespread loss of power. Ransomware incidents such as WannaCry and NotPetya demonstrate how the rapid growth of the internet-of-things further complicates the threat as everyday devices can be targeted by malicious cyber actors with potentially far-reaching consequences. 1. Risk prioritization. The foremost responsibility of DHS is to safeguard the American people and we must prioritize our efforts to focus on systemic risks and the greatest cybersecurity threats and vulnerabilities faced by the American people and our homeland. 2. Cost-effectiveness. Cyberspace is highly complex and DHS efforts to increase cybersecurity must be continuously evaluated and reprioritized to ensure the best results for investments made. 3. Innovation and agility. Cyberspace is an evolving domain with emergent risks. Although the proliferation of technology leads to new risks, it also provides an opportunity for innovation. DHS must lead by example in researching, developing, adapting, and employing cutting-edge cybersecurity capabilities and remain agile in its efforts to keep up with evolving threats and technologies. 4. Collaboration. The growth and development of the Internet has been primarily driven by the private sector and the security of cyberspace is an inherently cross-cutting challenge. To accomplish our cybersecurity goals, we must work in a collaborative manner across our Components and with other federal and nonfederal partners. 5. Global approach. Robust international engagement and collaboration is required to accomplish our national cybersecurity goals. DHS must engage internationally to manage global cyber risks, respond to worldwide incidents, and disrupt growing transnational cyber threats as well as encourage other nations and foreign entities to adopt the policies necessary to create an open, interoperable, secure, and reliable Internet. 6. Balanced equities. Cyberspace empowers people and enables prosperity worldwide. Cybersecurity is not an end unto itself, and efforts to mitigate cybersecurity risks must also support international commerce, strengthen international security, and foster free expression and innovation. 7. National values. DHS must uphold privacy, civil rights, and civil liberties in accordance with applicable law and policy. The Department empowers our cybersecurity programs to succeed by integrating privacy protections from the outset and employing a layered approach to privacy and civil liberties oversight.